Like the infamous “Crasher Squirrel” that launched one of the most prolific memes in online history, “crasher asteroids” have photobombed the Hubble Space Telescope’s otherwise uninterrupted view of the ancient universe. While carrying out its Frontier Fields survey of a random postage stamp-sized part of the sky in the direction of the galaxy cluster Abell 370, Hubble imaged many galaxies located at different distances over different epochs in time. Visible in the observation are elliptical galaxies and spiral galaxies. Many are bright and bluish, but the vast majority are dim and reddish. The reddest blobs are the most distant galaxies in our observable universe; their light has been stretched (red-shifted) after traveling for billions of years through an expanding cosmos. These galaxies are the most ancient galaxies that formed within a billion years after the Big Bang. Abel 370 is located along the solar system’s ecliptic plane, around which the planets orbit the sun and the majority of asteroids in the asteroid belt between Mars and Jupiter are located. So, like looking through a swarm of bees, Hubble has captured the trails of asteroids in the foreground. The trails themselves are created not by the motion of the asteroids, however, but by the motion of Hubble. While fixing its gaze on distant galaxies for hours at a time as it orbits Earth, Hubble’s position changes and, through an observational effect known as parallax, the positions of those asteroids appear to trace an arc when compared with the stationary background of galaxies billions of light-years distant. As Hubble scanned its field of view, it revealed 20 asteroid trails, seven of which are unique objects (some of the asteroid trails were repeated observations of the same object, just captured at different times in Hubble’s orbit). Only two of these asteroids were previously discovered, the other five are newly discovered objects that were too faint for other observatories to detect. So it goes to show that photobombing asteroids are useful for science and, though Hubble was observing the most distant objects in the cosmos, it was able to see a few of the rocks in our cosmic backyard. *NOTE: Asteroids formed around the time our solar system first started creating planets, some 4.6 billion years ago. The most ancient galaxies are located over 13 billion light-years away, meaning the ancient light from those galaxies was produced 13 billion years ago. It sounds like an over-hyped public service announcement: If you don’t recycle, you’ll die a premature death. But in the case of galaxies, according to three new Science papers based on Hubble Space Telescope data, this is a reality. Should a galaxy “go green,” reusing waste stellar gas contained within huge halos situated outside their visible disks, they will fuel future star-birth cycles, prolonging their lifespans. Sadly for “starburst” galaxies — galaxies that undergo rapid star generation over very short time periods — they care little for recycling, resulting in an untimely death. Using data from Hubble’s Cosmic Origins Spectrograph (COS), three teams studied 40 galaxies (including the Milky Way) and discovered vast halos of waste stellar gases. Contained within these spherical reservoirs — extending up to 450,000 light-years from their bright disks of stars — light elements such as hydrogen and helium were found to be laced with heavier elements like carbon, oxygen, nitrogen and neon. There’s only one place these heavy elements could have come from: fusion processes in the cores of stars and supernovae. Interestingly, the quantity of heavy elements contained within the newly-discovered halos is similar to what is contained in the interstellar gases within the galaxies themselves. But these heavy elements are stored in halos outside the galaxies; how the heck did it get there? According to the researchers, powerful stellar winds jetting into intergalactic space have been observed, transporting the heavy elements with them. But there’s a catch. If the outflow is too strong, waste stellar gases are ejected from the galaxies completely. 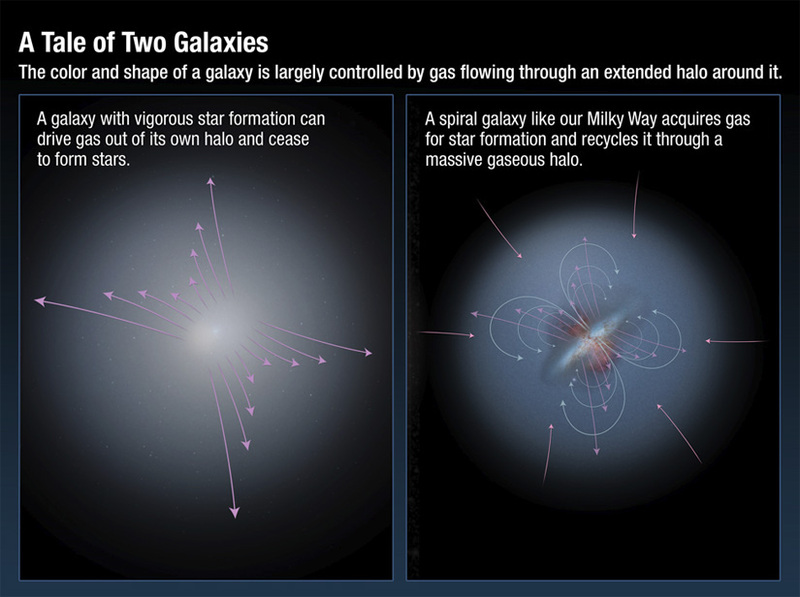 Unfortunately for one sub-set of galaxies, powerful stellar outflows come naturally. Starburst galaxies rapidly generate stars, ejecting speedy streams of stellar waste gas. Some of these streams have been clocked traveling at 2 million miles per hour, escaping from the galaxy forever. In the case of a starbust galaxy, a “recycling halo” cannot be re-supplied — future star birth is therefore killed off.